On 5-10 November 2017, the Council of Delegates of the International Union of Superiors General (UISG) met in Manila, Philippines. The meeting focused on the theme of “building community in an intercultural world.” One of our SSpS sisters was a resource person – Sr. Eden Panganiban. The following is an excerpt from the article published by Global Sisters Report about the event. 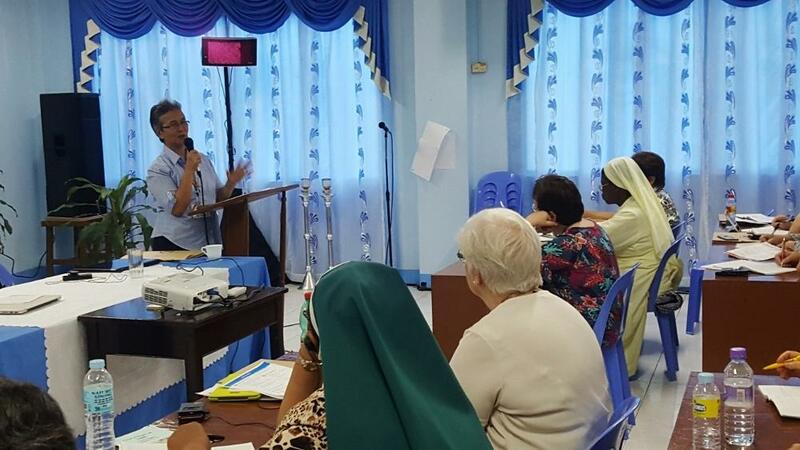 Sr. Eden Panganiban, who has held several leadership positions with the Missionary Sisters Servants of the Holy Spirit, gave an overview of the cultural changes within the congregation and an acculturation process that the Philippines North Province community uses in welcoming sisters from other countries. For example, the Missionary Servants of the Holy Spirit were founded in Germany 128 years ago, and, until 15 years ago, Germans were the largest ethnic group in the congregation. By the end of 2016, Indonesians were the largest group in the 3,045-member congregation with 763 sisters (25 percent), followed by Indians at 13.6 percent and Germans at 11 percent. Fifty-one nationalities are represented among the 427 Missionary Sisters Servants of the Holy Spirit communities around the world, based in 49 countries. The Philippines North Province has received 100 sisters over the past 10 years, most from other communities throughout Asia for university study, formation courses, to learn English or for cross-cultural mission experience. Currently, the province’s 162 sisters are from 12 nations, with Indonesians and Vietnamese being the largest. While the integration process is fluid, depending on an individual’s needs, language proficiency and experience, Panganiban said there are four distinct parts to the process. The first two steps provide basic information about the community and sensitivity training to appreciate cultural differences through formal sessions or informal exchanges. A third step is guided immersion, or “learning by doing,” which helps foster a sense of belonging and addresses culture shock. The final step is gaining proficiency in the local language, which facilitates adjustment and enhances social skills.